Strange things can occur on the long run. This past Sunday, I had something of a time altering experience in which I am driven to write about this small happening rather than finishing up the post that I have dedicated to 6 weeks of my training. Since Running is not everyone’s special interest, I am going to toss up the Visual now and include a couple of definitions. Hopefully, you non-runners who have made it this far won’t fall asleep. I was supposed to only run 18 miles during this run, but I miscalculated when I should have turned around, I ran a BONUS 0.75 miles. I am really only looking at the run up to the 18 mile point. The table shows each mile split (i.e. 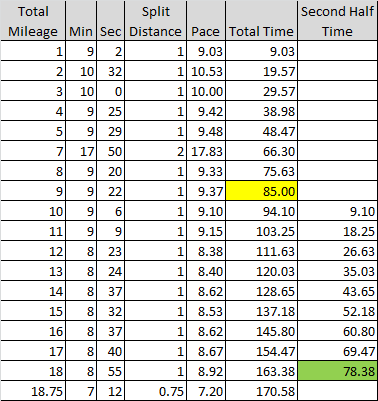 when I hit my stopwatch – tried to do it at mile intervals), how fast I ran each one of those splits, and how much time it took me overall. The first 9 miles took me 85 minutes to run (Yellow Square)… that’s 1 hour 25 minutes. That means, on average for the first 9 miles, it took me 9 minutes and 26 seconds to run a mile. But something happened around mile 11, and something in a good way. The second 9 miles took me 78.38 minutes (Green Square)… that’s 1 hour 18 minutes and 23 seconds. An average mile in 8 minutes 43 seconds. In the industry, that’s called a Negative Split. And it’s a sizeable one too! You might say it could be the course, but the course I ran was pretty much out-and-back, meaning that I was running across the same terrain. The first half was about as hilly/flat as the second half. This run was 5 weeks out from the Chickamauga Marathon, but it suggests that were I able to keep my performance up for another 8 miles that I could finish in under 4 hours (my highest goal for the marathon distance). Who knows what it really means when it comes to Race Day (November 10th 2012), but it bodes well. This entry was posted in running and tagged chickamauga marathon, long run, marathon training. Bookmark the permalink.